How to print library overdue notices. Question/Topic: How to print library overdue notices? This feature is included in the Library solutions starting with version 2.1 (release date: March, 2009). You can upgrade your library solution: Library Upgrade. b. Click on the Loan tab. Click with right mouse button on the Loan field to display pop-up menu. Select Manage Loans command. How to print library overdue notices? Click Overdue (1) to display overdue items. Overdue items are displayed in the table (2). Click Overdue Notices (3) button. 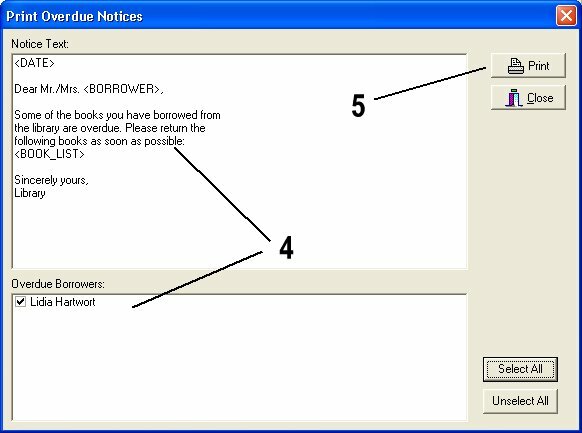 Verify the notice text and the borrower list in the Print Overdue Notices (4) window. Click Print (5) to preview/print notices.